Lead author Susan Nitzke, PhD, RD, is a professor, extension specialist, and chair of the Nutritional Sciences Department at the University of Wisconsin-Madison. All four principal authors-Dave Riley, PhD, Ann Ramminger, MS, Georgine Jacobs, MS, along with Nitzke-and contributing author Ellen Sullivan, MS, RD, are professors or nutrition professionals who have extensive academic and practical experience in early childhood education. Nutrition has vital and long-lasting effects on children's development. Good nutrition helps children learn better and promotes lifelong healthy eating habits. 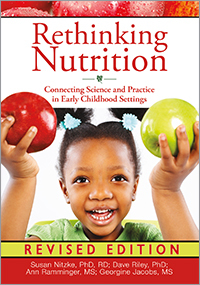 Connecting current scientific research with best practices, Rethinking Nutrition provides information to help you meet and understand children's nutritional and developmental needs.